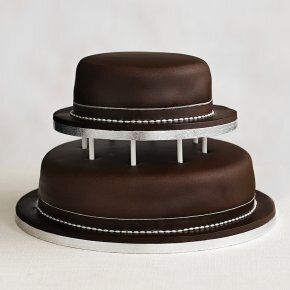 This undecorated classic 2 tier chocolate sponge wedding cake filled with rich chocolate ganache is covered with soft chocolate icing and hand finished with satin ribbon. Dowling rods make this the perfect choice to decorate with fresh flowers. This cake is available in 4 options. Filling: Chocolate sponge with chocolate ganache.